Industrial coat hook, all steel made from pipe fittings and clevis hook. Get that great industrial look and functionality. This is a solid piece made to last several lifetimes. Raw natural color of the pipe makes for a great industrial look! "Screws for mounting not included." This will make any room, bathroom, bar, or living space have an industrial rustic or vintage feel. These are very versatile and can be used for: Coat Hook, Towel Hook, Door Hook, Robe Hook, Hat Hook, Apron Hook, Heavy Duty Hook, Urban Industrial Decor, Industrial Furniture, and Plumbing Pipe Hook. This hook extends approximately 3 INCHES off the wall and offers maximum storage! As for durability, this hook is almost indestructible. 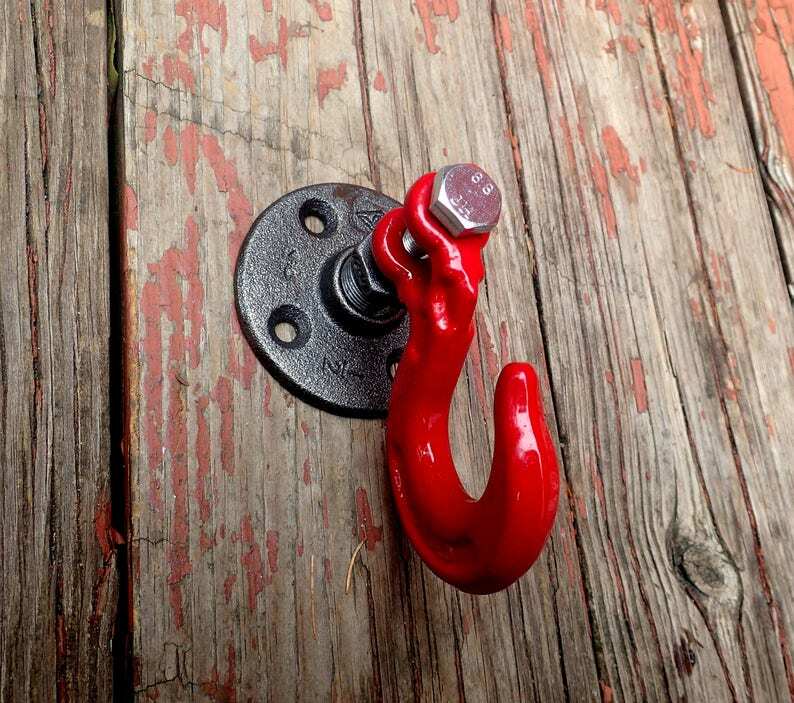 Finish & Protection: All of our hardware is NEW and unused Raw Black Malleable Iron. We keep the material raw to give our clients complete control on customizing the finish of the hardware. We have a couple of suggestions to preserve and protect the hardware. You can keep the raw industrial look by applying a clear coat to the hardware (Rust-Oleum 7701830 Crystal Clear Enamel). Or you can also choose to paint (spray paint) the hardware to any color of your choice. We recommend any paint that is suitable for metal. EASY INSTALLATION gets you one step closer to a more organized and clutter free home. You will no longer have to throw your coat on your bed or couch. VERSATILE use this hook for purposes other than just hanging your coats, clothes, or hats. Hang your favorite jewelry, towels, apron, bag and umbrella. Super heavy and solid. Arrived quickly. My crane/tow truck obsessed toddler will love them for his new room:). Thanks!